Why Do Flies Rub Their Hands? If you watch a fly long enough, you'll catch him rubbing his "hands" together like a comic book super villain. There's a simple explanation for this behavior that has nothing to do with devious machinations: Flies are epic self-groomers. Flies are six-legged insects, most of whom go through multiple growth stages and don a single pair of wings as adults. Though many species of flies look similar, their miniscule bodies have sometimes dramatic differences in color and proportion. The common housefly, Musca domestica, is the de facto poster child for the taxon. And with good reason: Flies are ubiquitous the world over, they're vectors for multiple diseases, and they've landed starring roles in touchstone horror movies like "The Fly." Despite their infamy, though, there's little about them that could be described as devious, physiologically speaking. One of the hallmarks of fly behavior is "hand" rubbing. This is when flies rub their first set of limbs -- legs, technically -- over each other in rapid succession. It's present in many fly species, though arguably most obvious in houseflies, given their preponderance and proximity to people in rural and urban areas alike. Flies rub their limbs together to clean them. This may seem counterintuitive given these insects' seemingly insatiable lust for filth and grime, but grooming is actually one of their primary activities. It gets rid of physical and chemical detritus and clears up their smell receptors -- all of which is important for flying, finding food, courting mates and just about everything that a fly does. The next time a fly lands near you, watch him closely. Flies don't just rub their hands together -- they also rub their hands against their heads, wings and even rub their hind legs together. Fly cleaning rituals are thorough and exhaustive -- so much so that a University of Arizona extension outreach office recommends using them as a model to teach good hygiene to kindergarteners. Other bugs follow similar regimes, though antennae -- not present in flies -- appear to be the No. 1 priority for some insects, as discovered by North Carolina University researchers in 2013. During the course of a normal day, flies come into contact with many potentially harmful bacteria. Some of them are easier shed than others. One study from a group of scientists in Malaysia found that liquid-dispersed bacteria on their wings have a relatively low transfer and retention rate, despite -- or perhaps because of -- houseflies' fastidious grooming habits. Time of day may also be a factor. Some species are more active during particular times of day, such as fruit flies' proclivity for dawn and dusk, as confirmed by German researchers in 2007. A 1976 study from Oxford established a few inexplicable baselines for blowfly grooming that may likewise apply to other flies: Grooming occurs in bouts and often contains an odd number of acts. Odd indeed. 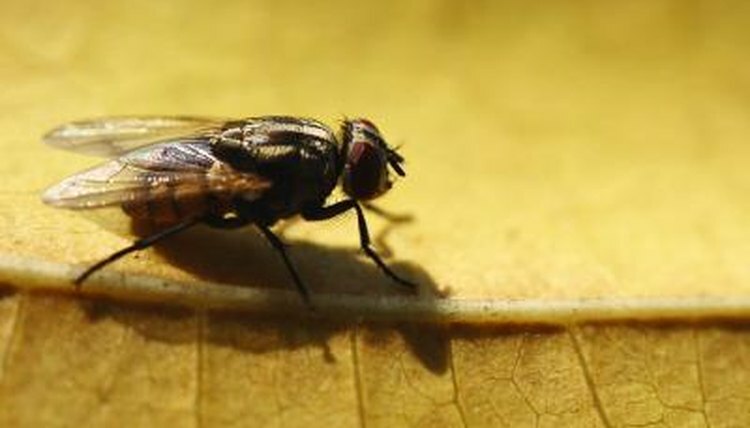 How it Works: Why Do Flies Rub Their Legs Together?